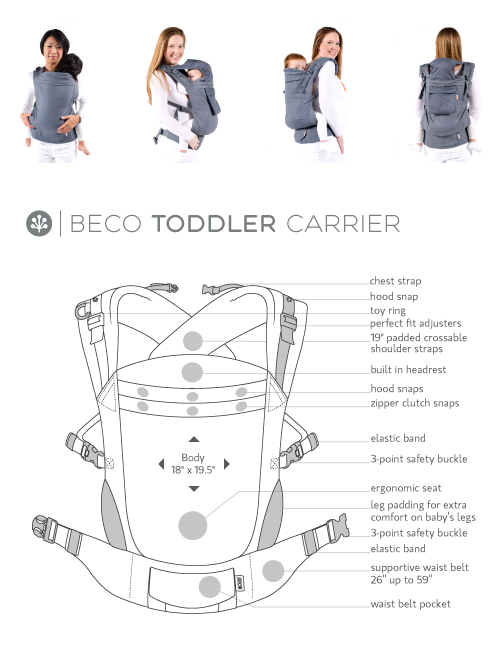 Beco Baby Carrier Limited Edition Carriers are small runs of the popular Beco Toddler Carrier. 50 units of each design are created. Abacus Grey - Abacus on grey canvas is a geometric print with fresh colors, turquoise blue backing and complimentary legs out padding. Weeble - White background with purple mottled triangles. Paired with navy canvas and a coordinating stripe on the legs out padding. Snippet - Turquoise, grey and black chevron patterns with little 'snippets' of words thrown in. Navy canvas backing and striped legs out padding. Spot On 2 - Redux! This time the colorful arrows are paired with light grey canvas that has a lime green backing. Super fresh and fun! We only ship Beco Toddler Carriers to addresses in the USA.